We are just back from this summer’s World Harp Congress, where we gave the world premier of our new show, Ariadne Rediviva. There was certainly a long build-up to this moment and a lot of work went into this production, so it was incredibly fulfilling to see it finally brought to life. Ariadne Rediviva has been our entrance, as a duo, into a new genre of stage performance, where extra elements of visual art and storytelling bring out the depth of the music. As we go beyond our usual format, we also go beyond ourselves. From the conception of the project, there have been so many wonderful people involved. In the beginning, there were the composers whom we approached to write music for the show. Even before we knew how we would pay them, they were on board with the idea—their enthusiasm already forming the backbone of the show. Last year in November and December, the show received a great infusion of support from the contributors to our crowd funding campaign. We were overwhelmed by the response we got when we reached out for help to get the show off the ground. Finally, in the last days of preparation, as we scrambled through the inevitable last-minute complications, we were indebted in numerous little ways to everyone who stepped in and lent a hand—you know who you are. 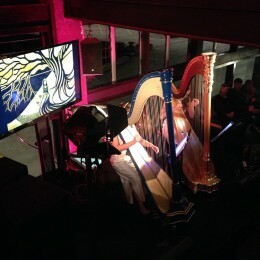 The World Harp Congress—an international gathering of harpists from around the world—takes place in a different location every three years. This year was in Sydney, Australia. So, this July we packed our music, our costumes, our drums and chimes and embarked on a journey that circumnavigated the globe. Marta flew west, over America, and Elizabeth flew east, passing through the United Arab Emirates and Malaysia. After so many months of preparation and such good reception from our pre-premier in Paris, we were confident that Ariadne Rediviva was ready to be shared with the world. Just as we were leaving, however, we received a message from our singer who had fallen seriously ill and sorrowfully informed us that she would not be able to travel. It was a frightening moment us—how would we debut the show without her voice to carry the central piece? Thus, from the first moments of the trip, we were emailing the congress organizers to see if we could find a replacement singer. When you travel to the other side of the world, there are so many unknowns, that you can never really know what to expect. That is, of course, one of the greatest charms of traveling. In Sydney, we had the opportunity to meet and work with soprano Rowena Cowley, a voice professor from the Sydney Conservatory of Music and a specialist in contemporary music. She saved us, stepping in just three days before the performance and learning a very difficult piece in a short time. We also had the pleasure of working with Mary Doumany, who organized the Harp Lounge series which our concert was a part of. 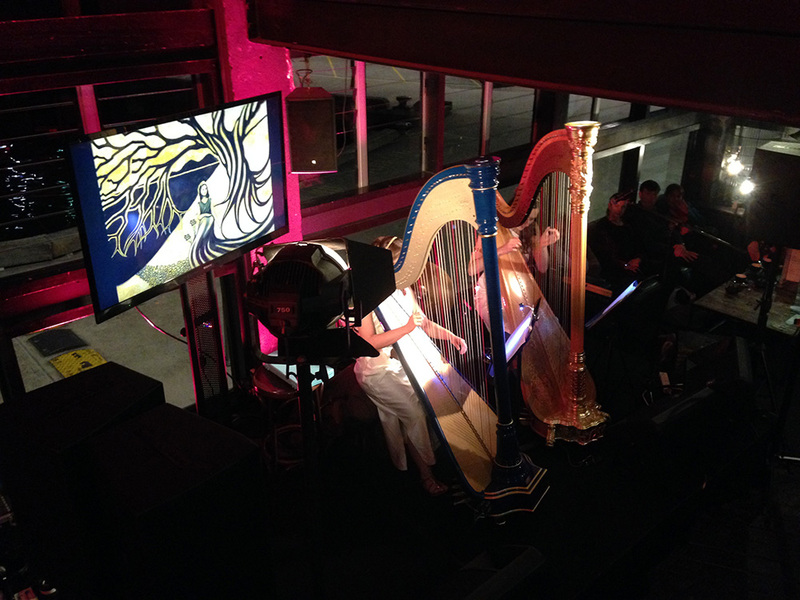 The Harp Lounge venue itself was our second hurdle to overcome—it turned out to be both a challenge and a blessing. 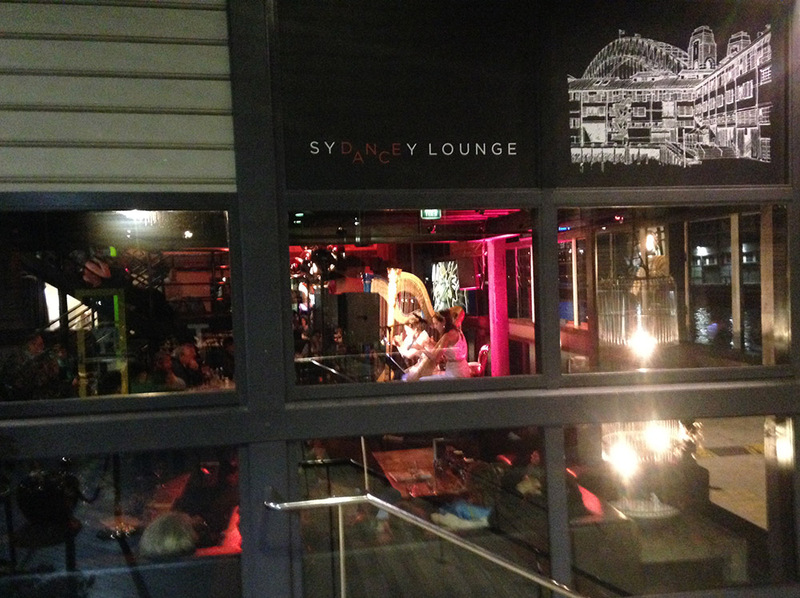 Far from being a typical concert hall, it was in fact only a temporary stage set up in the Sydney Dance Café. The evening before Ariadne was to play, we went to that night’s Harp Lounge performance, as a way of scoping out the venue. The genre that night was jazz, which seemed to fit the room perfectly. People sat around tables drinking and eating dinner. Dishes clattered behind the bar, and music from dance classes leaked through from the studios down the hall. It was a fun, relaxed environment, but how on earth would anyone be able to hear our show over all the noise? Ariadne Rediviva is meant for a quieter venue, so that people can understand the narration and appreciate the more sensitive musical moments. It was nerve-wracking to improvise our way around these unexpected twists of fate, but we had already come this far and we knew we had to carry the show through as best as we could. 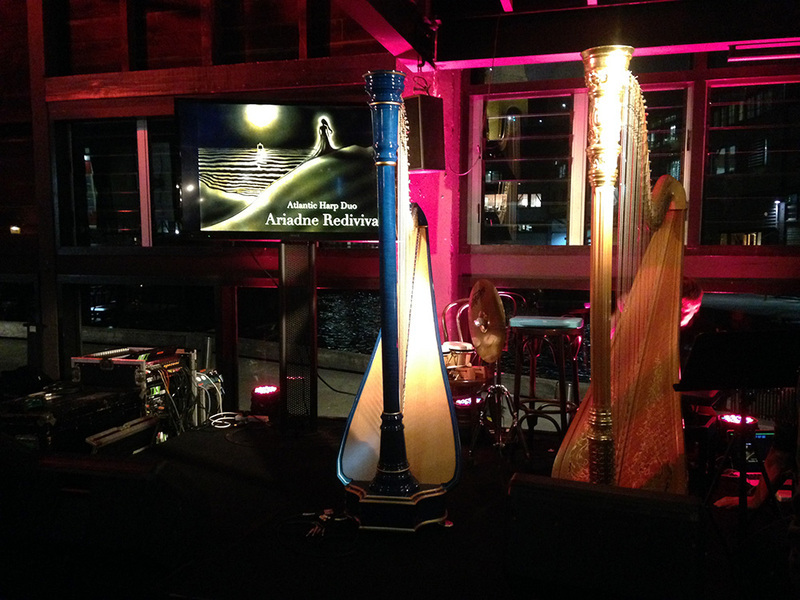 We decided to amplify both the harps for the entire concert, and we were lucky to have an extremely professional sound technician working the venue. Mary Doumany also stepped in and made an announcement before we played, to ask everyone for their attention. Even that might not have been enough, but as we ran the first video segment of the show—with Eugenie’s voice reading the first stanza’s of Marta poem, as we watched Elizabeth’s video montage of Megan’s dancing—we were amazed by the silence that spread through the café. Our audience was amazing. 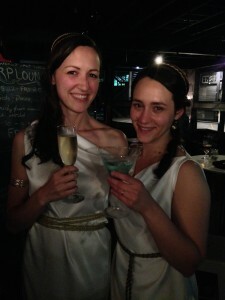 We heard later that some people had even asked the bartenders to be more quiet with the dishes. While we would never have chosen such a place as our ideal venue, especially for a world premier, it ended up being an unexpectedly cool place to play. We may have even been able to reach some people we wouldn’t have otherwise. Congratulations on your exquisite performance last night. You invoked the Divine Feminine in a situation of unquestionable challenge. And when stately Rowena took the stage and sang, it was as if a queen was among us. There was something very beautiful about hearing and seeing your work in an unexpected environment. People were spellbound and even the dancers emerging from their class, were hushed and respectful. But here was the highlight: strangers came off the street, sat and listened and told me later that their lives had just been changed. Ladies, last night, the Harplounge achieved more than I could have hoped for. We are proud to say the show has now begun! Thank you to everyone who was in any way a part of the crazy, enriching experience this has been.